This past weekend several meteorite hobbyists met up for a weekend hunt at Franconia in recognition of the 10th anniversary of the discovery of the strewn field(s). I got into camp around noon on Friday and met Frank C., who was taking a break in the shade of his camper. I unloaded my water and firewood off the roof-rack, set my solar shower in the sun, and headed out to get a few hours hunting in before dark. Fellow hunter Mitchel caught a ride with me into the strewn field. Mitchel had just found a nice gold/quartz nugget the day before. We parked at the tunnel and as we were heading in I heard Dave call out his 3.5g iron find on the radio, awesome! Mitchel and I headed west, I wanted to go to the find location for SaW 002 because I had a small piece of it with me. 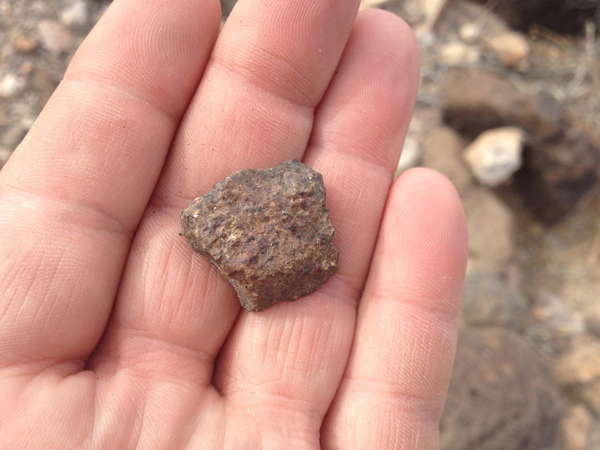 On the way over we found Troy busy digging up his third find of the day, a nice little chondrite. I hadn't been in the field an hour and two people are making finds, this was great. Mitchel and I left Troy to do his thing, and headed over to meet up with the gang just as Richard, Jim, and Dave found a 3-piece puzzle chondrite, ~118g total, wow! 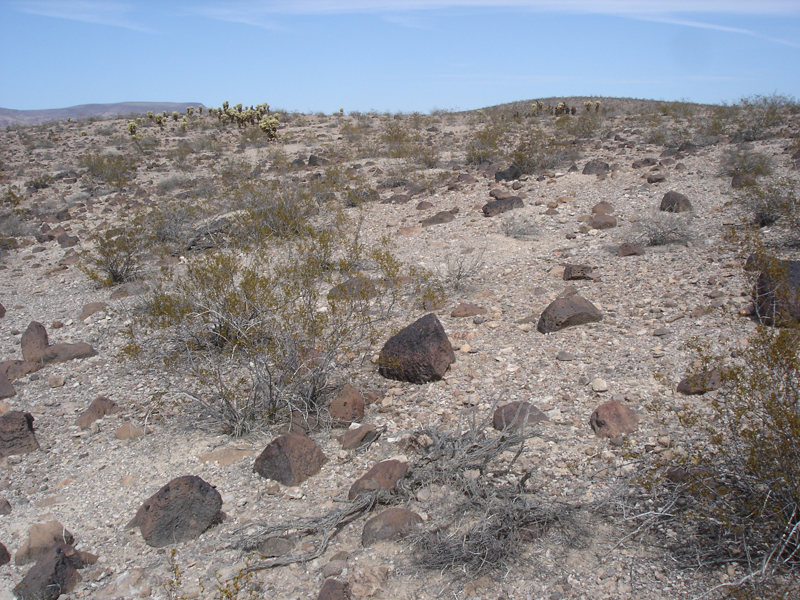 The group searched around that whole area (where Dennis would find a 75g chondrite the following morning), and then headed back to camp and/or their hotel rooms. When I got back to camp I chopped up the firewood I brought and then enjoyed a nice 105 *F shower off the side of my truck. Roughing it? Hardly. Those who camped enjoyed a great night around a fire under the stars. Jim brought a nice telescope out from the back of his rig and pointed it at various targets in the cosmos. Richard was a virtual planetarium, and he walked us all over the night sky. The next morning everyone converged on our camp before heading into the strewn field. 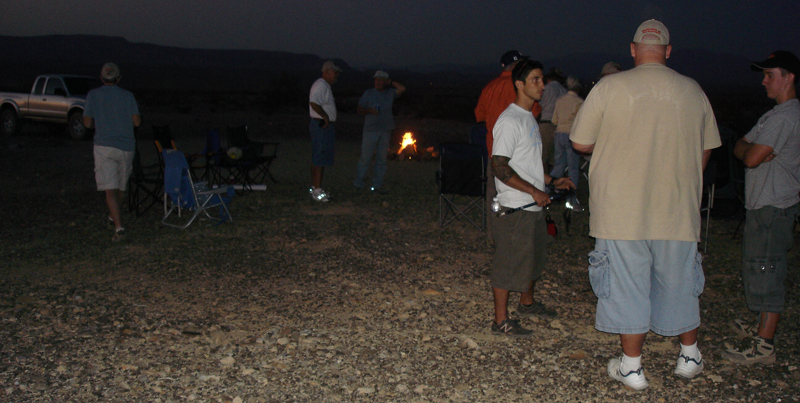 Here's a shot of Richard giving a pep-talk to several meteorite enthusiasts. Thanks, Richard! The weather felt warmer than it was, about 95 *F, but a breeze every now and then kept it from getting too uncomfortable. After a day of digging hot rocks and finding a couple bits of wire I headed back to the vehicles to have a late lunch and return to camp. Meteorite hunters Roy, Tom, and Cody can just be seen in the photo below, if you look hard enough, making their way back to the tunnel after a Saturday of hunting; for the trip Roy found 2 sub-gram irons and a 9.1g chondrite. 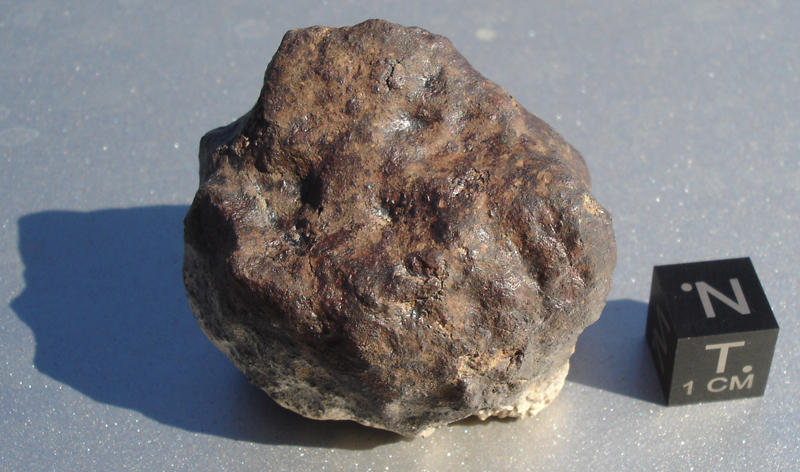 Roy's 9.1g chondrite, photo by Roy. Back at camp we were all treated to a spectacular Saturday night sunset. I think everyone took a picture of it at one point or another. 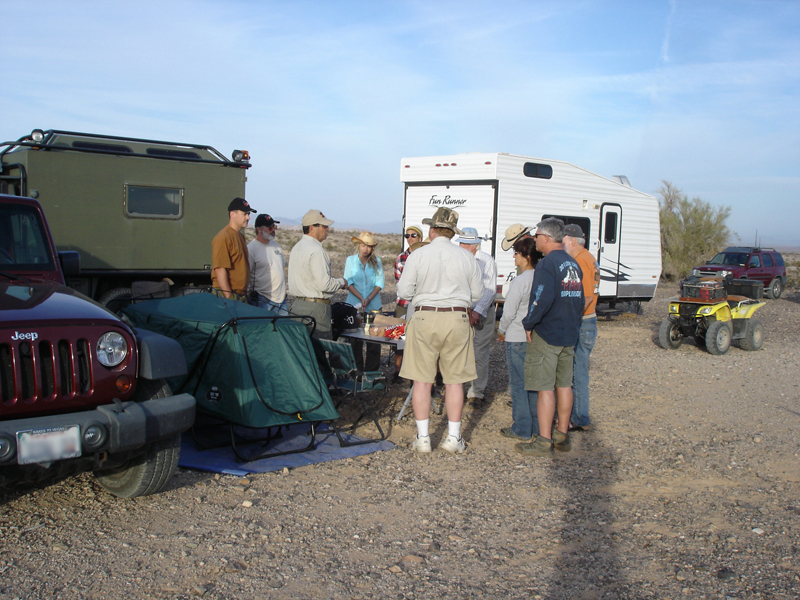 Here's everyone socializing at camp Saturday night, sharing stories of the day's hunt and talking meteorites. I got to see Robby's two finds, a 11.7g chondrite he picked out with his detector, and a super cool little <1g chondrite that had fusion crust on one side. 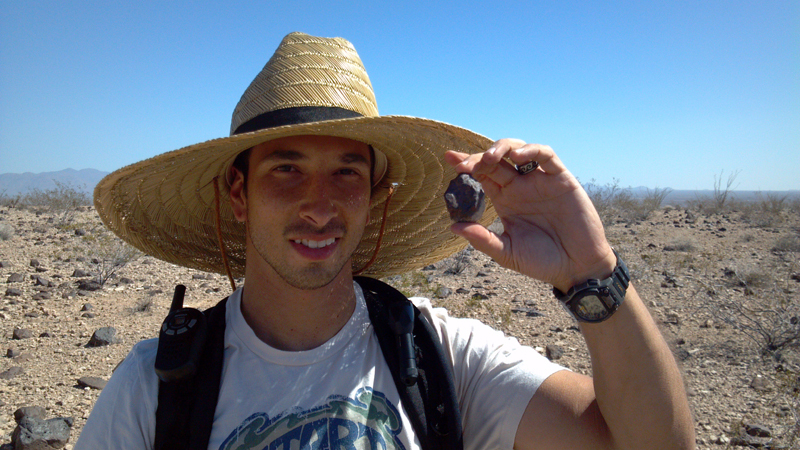 A short while later Mitchel found a 121g chondrite! Photo by Mitchel. 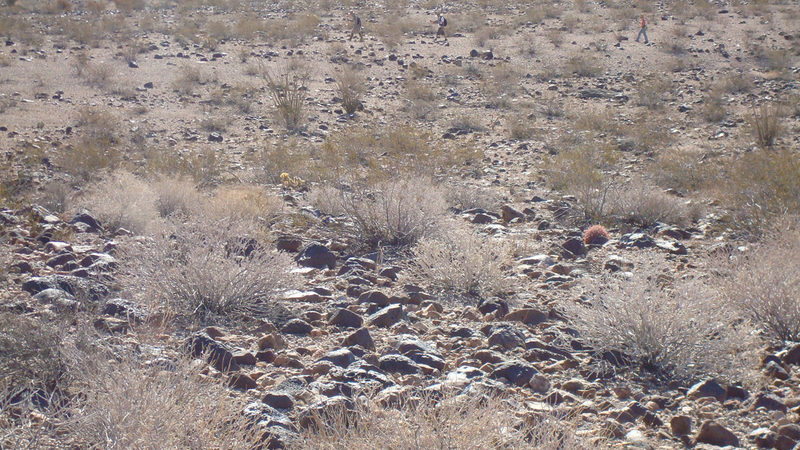 We paused on our hike in to contemplate one of the only two Ocotillo that still had any leaves, much less was alive at all, in the Warm Springs Wilderness (the other is at the left edge of the photo). Photo of author by Vinnie and Michelle. 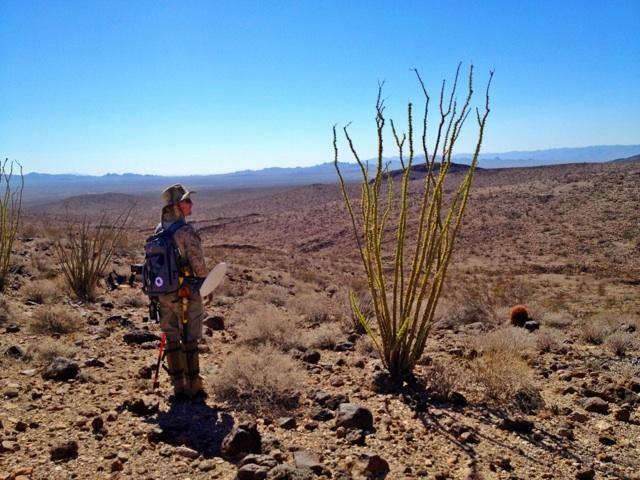 Our plan was to split up and hunt this area until about noon, and then hike back and return home. 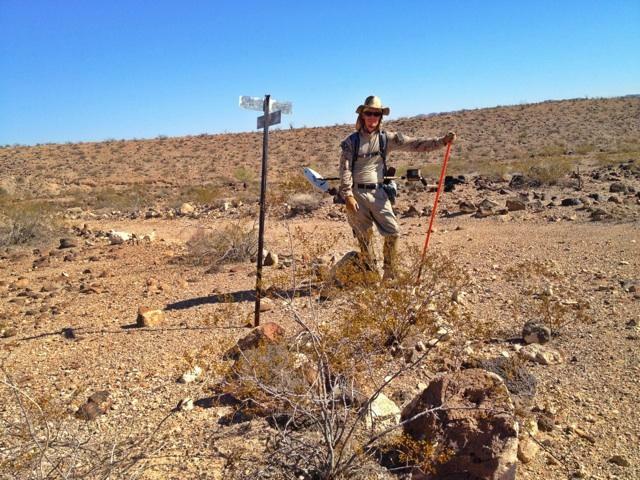 At 12:04pm I radioed Vinnie that I was heading over his direction since it was time to start heading back. Vinnie positioned himself between where Michelle was hunting and where I was coming from, looked down, noticed a dark rock, and picked it up with his magnet. I was only a couple hundred feet away when he radioed and said he had a suspicious rock for me to check out; that got me excited and I was hoping it was the real thing. I knew once I saw it that it was a meteorite, but got out my loupe just to be sure. There's no mistaking that fusion crust under 30x magnification, and I congratulated him on finding his first rock from outer space. I guessed its mass about 80 grams, and when we put it on my balance I let out a cheer when 83.5g flashed on the display. 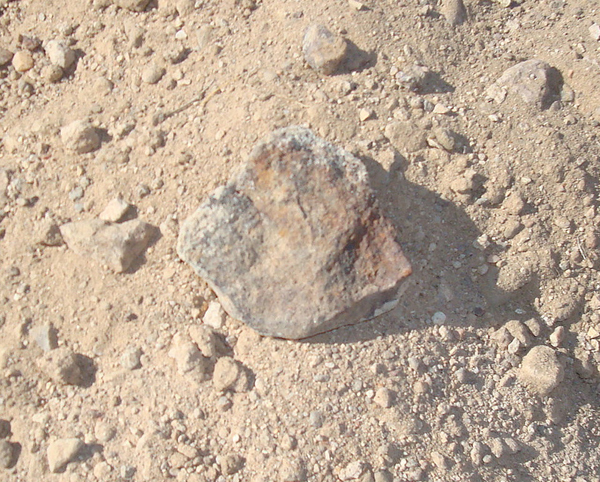 Given where he found the meteorite and the little bit of its interior I was able to see where the fusion crust had chipped off one small corner, I guessed that it might just be a Warm Springs Wilderness meteorite, but only a formal scientific classification could say for certain. Although I wasn't fortunate enough to find any meteorites this trip, being there for Vinnie and Michelle to get their first more than made up for it. Besides, there's plenty more out there still. Happy trails! Photo of author by Vinnie and Michelle.